There are only a few places left in the Market Trends in Service Provider Networks virtual classroom on February 11th. If you’d like to attend, register ASAP. It’s almost unbelievable: more than 10 years after the IPv6 specs have been completed, someone finally realized it would be a good idea to specify the minimum requirements for a decent IPv6 CPE router. While this document will not solve the lack of low-cost IPv6-ready CPE devices, it’s definitely a step in the right direction, more so as it clearly acknowledges the need for DHCPv6 (some people still believe SLAAC is the solution to every problem ever invented). Greg Ferro has republished an older post in which he compares Cloud Computing with public transport (and notes that nothing has changed in more than a year since he wrote the original article). His analogy is more than fitting; a perfect example is Google’s new Google Docs offering, where Stephen Foskett did a nice cost analysis of the unsupported service as compared to supported one. I’m describing aspects of cloud computing in its various incarnations in my Next-generation IP Services workshop. You can attend an online version of the workshop or we can organize a dedicated event for your team. Translated into public transport terms: if you want to fly cheap, choose Ryan Air (in Google’s case, you pay 25 cents per gigabyte per year); if you want reasonable support and flexibility, use Lufthansa ($3.50 per gigabyte per year for Google Apps Premier Edition customers or 14 times more than the unsupported capacity). When the current variant of IPv6 was selected 15 years ago, seamless integration with IPv4 was a big deal, resulting in NAT-PT architecture. 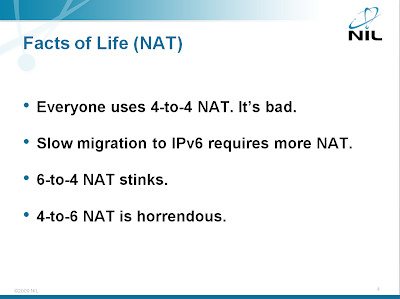 NAT-PT tried to solve too many problems and (as I pointed out in my IPv6 Deployment workshop), while the 6to4 NAT is manageable, the 4to6 NAT is horrific (NAT64 and DNS64 are more reasonable; more about them in an upcoming post). NAT between IPv4 and IPv6 hosts is just one of the topics covered in the Enterprise IPv6 Deployment workshop. You can attend an online version of the workshop or we can organize a dedicated event for your team. To make matters worse, the NAT-PT implemented in Cisco IOS is totally broken due to removal of fast switching support in IOS release 12.4(20)T and numerous other releases. As I wrote a year and a half ago, removing fast switching will bite us eventually … and so it does when you try to use NAT-PT. A few hours after I’ve published my review of the “Cisco routers for the desperate” book someone posted a link to a digital (pirated) copy of the book to my Facebook page, no doubt feeling like a hero fighting for the freedom of information (or some similar nonsense). I didn’t even try to download the book to see whether it was a leaked copy from the publisher (in which case someone has some serious problems) or a scanned PDF. Bad designer wrote an interesting comment to my yesterday’s post: 2G and 3G networks have huge latency issues. GPRS is intolerable, UMTS is awful and HSPDA is reasonable but still not what one would hope for. The latency does not seem to be associated with serialization delay. UMTS gives you reasonable transfer rates and significant latency and GPRS gives you an order of magnitude higher latency than ISDN with comparable transfer rate. If anyone knows enough about the mobile technologies to explain this phenomenon (or at least give me useful pointers) I’d really appreciate your comments. Are you lost in the immense generational marketing hype surrounding wireless technologies? Robert Lesar, one of our top CCIEs, finally had enough and decided to classify various wireless technologies in terms that anyone can understand. The result: the “First-Mile Wireless” IP Corner article. When I was testing EEM SNMP integration, I wanted to decode the SNMP traps sent by the router with Wireshark. Wireshark performed wonderfully, but could not decode the Cisco-specific object IDs used in the traps. I knew I had to download Cisco-specific MIB files and install them in Wireshark, but doing that proved a bit harder than expected … and the Wireshark and NetSNMP documentation was not too helpful. You can find the final results of my struggles in the “Add MIB files to Wireshark SNMP decoder” article in the CT3 wiki.